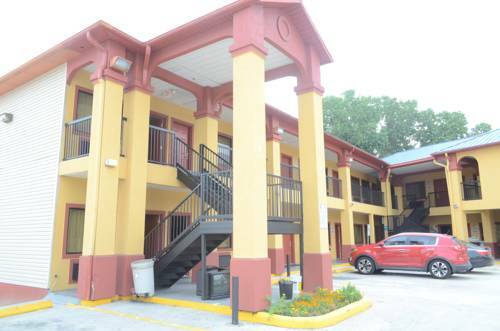 All the comforts of home conveniently located in Houston downtown/ just a short drive from the Houston Intercontinental Airport await you at the Americas Best Value Inn and Suites of Houston/ TX. For that much deserved vacation getaway or for your business travel needs/ our guest rooms are comfortably decorated for your enjoyment. We happily provide free wireless high-speed Internet access/ cable TV with HBO/ and a complimentary continental breakfast served daily. Twenty-four hour front desk staff and laundry service are available for your convenience. Our courteous staff will make your stay a pleasant one. Houston is best known for N.A.S.A. and the Johnson Space Center/ which boasts simulated space voyages and mission control panels/ teaching people of all ages about space travel. It also houses the Astronaut Gallery/ the Mission Status Exhibit/ the Starship Gallery and the N.A.S.A. Tram Tour. Bayou Place in downtown Houston features an abundance of international dining and entertainment options. A ride on Houston*s Metro Light Rail will take you by the world-renowned Texas Medical Center/ the Museum District and Reliant Park. Visitors can also step back in time at Sam Houston Park/ where the Heritage Society operates a museum and some historic buildings. Sports fans have a number of professional games to see while visiting Houston/ including a baseball game at Minute Maid Park or a football game at Reliant Stadium. Property is located in Houston downtown/ minutes from the Patton Road exit off I-45 north.